A Man From India: Is Kiyani good for India? I am glad that Prez Musharraf has stepped down and is signaling free elections soon. 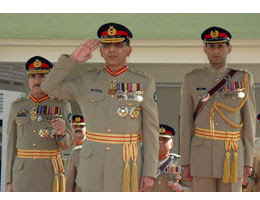 General Ashfaq Pervez Kiyani took charge as Pakistan's new Army Chief from President Pervez Musharraf today. Unlike in India, the Pakistan army chief's position has a big role to play in domestic politics and foreign relations. So, as this story unfolds in the media and experts do their analysis, I attempted to look up some information on whether Kiyani would be good for India. Here is some information that I found in the internet media today that is most relevant to Indians. He has been the former head of the ISI (Pakistan Intelligence Services). His Colleagues say Kiyani is more knowledgeable about al-Qaeda than any other army general. He oversaw troops during the standoff with India after the attack on the Indian parliament. Insiders say it was his expert handling of the situation, and his constant contact with the Indian command that kept the eight-month stand-off from becoming an outright war. He is said to have good relations with some of the country’s civilian political leaders, including former Prime Minister Benazir Bhutto. Those who know Kiyani say he’s smart, tough, talented — and pro-Western. It is a known fact that Pakistan's ISI has been providing logistic support to the Kashmir terrorists (Kashmiri freedom fighters - in Pakistan's perspective) and helping them infiltrate India's borders but at the same time he has proven his ability to influence politics and the army to avoid a war with India during the Indian Parliament bombings. His good relations with Bhutto and Musharraf are a plus for India as Musharraf will be president and Bhutto will probably be the next Prime Minister in Pakistan. Bhutto has suggested in many interviews that she would push for good relations with India. Since he has the insights into Alqaeda, it is fair to assume that he has pretty good insights into the Kashmiri terrorists. If Musharraf and Bhutto are in power, he is likely to be able to control cross border terrorism in India. Kiyani seems to be the right choice after Musharraf in aligning the Pakistan army's strategic objectives with the war on terrorism. Although, it seems that he has enough influence and control in the army to ensure that a Kargil does not happen again, only time will tell us whether Kiyani is good for India!